Figure 623. The Metronome section. 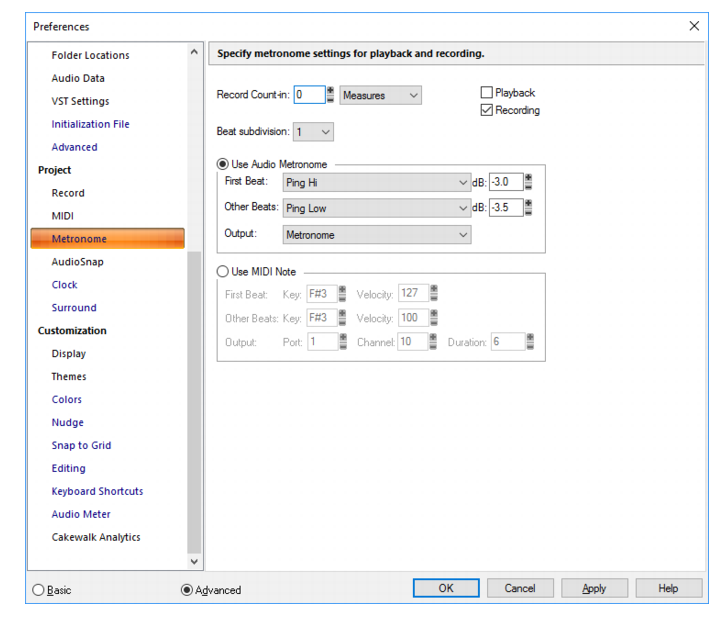 The Metronome section lets you specify metronome settings for playback and recording. Record count In. Specifies the number of count-in measures or beats. Measures. Choosing this option sets the Count-In units to measures. Beats. Choosing this option sets the Count-In units to beats. Note: The Record count-in always applies if there is a specified value, even if Playback and Record are not selected. Playback. Choosing this option cause the metronome to sound during playback. Recording. Choosing this option cause the metronome to sound during recording. Beat subdivision. Select the desired subdivision value in the Beat subdivision list. The selected value is the subdivision for non-accented audible clicks. Use Audio Metronome. Choosing this option causes the metronome to use audio. First Beat. Select an audio sound for the first beat. Other Beats. Select an audio sound for other beats. dB. Set the dB level for the corresponding beat. Output. Set the output you want to use for the audio metronome. Use MIDI Note. Choosing this option causes the metronome to sound by playing a MIDI note. First Beat. Choose a Key (a note) and a Velocity for the first metronome attack in the measure. Other Beats. Choose a Key (a note) and a Velocity for the other metronome attacks in the measure. Port. Choose the port that the MIDI note plays through. Channel. Choose the MIDI channel your metronome plays on. Duration. Choose how many Ticks you want the metronome sound to last.